So let me set this up for you. Jesus is hanging out with his posse of disciples who have just finished baptizing people in a local river down in south central Israel. Now it’s time to take the tour on up the road as they head back to their base in Galilee, but they have to go through Samaria, home of the Samaritans. What’s the big deal with Samaritans anyway? Well, you might call them THE stain on Israel’s political, cultural, and religious conscience. 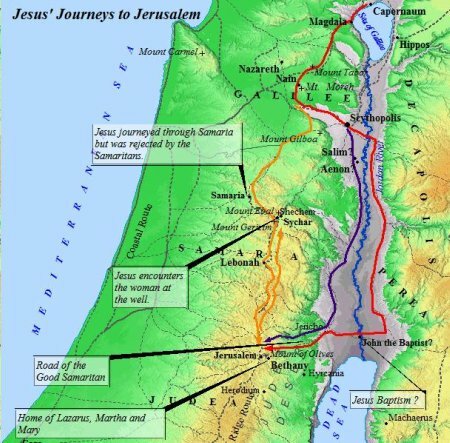 Not only were they the capital of the confederacy when Israel was divided, but they intermarried with foreigners from an invading nation while the rest of the country was in captivity to that nation, and they even had the audacity to create a counterfeit version of the Hebrew Scriptures and call their mountain the equivalent spiritual capital to rival Jerusalem just for spite. They were a politically incorrect, crossbred group of religious heretics who are at odds with all that proper Jews professed to be about. They were an outcast community. The posse arrives just outside a town called Sychar, and Jesus sends his boys off to go find some lunch while he decides to sit at the local watering hole. He sees a woman there who appears to be an outcast from even her own outcast community. How does he know this? Because back in the day, wells were places of social gathering; and people typically gathered their daily supply of water in the morning while it was still cool outside. This woman is alone during the hottest part of the day—two big clues. Let’s just say this is a woman of reputation, and not the good kind. She is unwanted and unwelcome by her community, and yet, this is the person Jesus wants to strike up a conversation with. ‘Wait a minute! Is he talking to me? He’s got to know who and what I am,’ she thinks. It’s like she’s that one kid on the playground that nobody wants to play with, and then, all of a sudden, the most popular boy in school comes up to her and asks her to play with him. And this is where the conversation takes a turn because he doesn’t actually answer her question. Instead, he presents her with an offer for something familiar yet altogether strange. Jesus starts talking to her about gifts from God and access to something called “living” water, which he offers her! It’s the kind of water you don’t collect in a water pot. It’s the kind of water you don’t draw from a deep well. It’s the kind of water you can access anytime. It’s the kind of water you don’t need to drink again, ever. Now this is where the truth starts to come out. This is where she starts to get honest about why she’s at the well alone in the middle of the day. She has no husband. But that isn’t entirely the truth now, is it? He tells her she’s been married, not once but five times before. And, in her day, the only legal way a woman was released from marriage and could remarry was for the previous husband to pass away. So, it might be safe to call her a “Black Widow” because her husbands somehow end up dying mysteriously from natural or unnatural causes (nobody seems to know exactly). Maybe she thinks herself cursed. Maybe others do too. Maybe she’s worried about cursing her current man to death if they get married; so they just live together instead. The water pot hits the ground. This woman is so overwhelmed by his news she leaves her water pot and runs away to tell others about this man. And her message isn’t about water or wells or husbands or mountaintops or any of that stuff. She tells them, “Come meet a man who told me everything I ever did! Could he possibly be the Messiah; the one we’ve been waiting for? He knows me for me! Not my culture. Not my race. Not my heritage. Not my past. Not my present circumstances. No! Just ME!” She left her water pot behind because she had become the water pot. She was filled to brimming with the truth of who Jesus was and the transformation that had just taken place in her heart that she couldn’t help but pour out this good news to those of her village, the very community from which she had been an outcast! Jesus needs no water pot. He needs no well. He needs no mountain. He looks beyond ALL the social, cultural, political, religious, or other stigma that keep people from accessing God and says, “Give ME to drink.” All he needs is a vessel willing to accept his offer. Better than Gatorade, deeper than that deep, down body thirst, this living water quenches the thirst of a soul that longs to be known of God and to know God. It quenches a thirst at the base of our very selves: a thirst for acceptance, for love, for respect, for dignity, for protection and commitment and joy and peace and hope and a whole host of needs we, as people, long for. This water transcends human institutions and traditions. It is spirit. And it is truth. And we have access to it, ALWAYS.